The rising demand for automated and self-service processes and increasing IT spending on airports, so as to achieve higher operational efficiency and give passengers a digitally rich and enhanced travel experience, has led to an increased rise in the integration of information systems across domestic and international airports. The aviation industry is expected to further increase the demand for more effective and reliable airport information systems in the future years as passengers become more used to technological nuances and digital devices. Transparency Market Research predicts that the global airport information system market will expand at a favorable 7.2% CAGR over the period between 2016 and 2024. As a result, the market will rise from a valuation of US$25,185.0 mn in 2015 to US$46,950.6 mn by 2024. Based on types of solutions typically employed in airport information systems, the market can be segmented into flight information display systems (FIDS), resource management solutions, public address systems, baggage processing solutions, passenger processing solutions, airport operations, airport information systems, and airport operational database (AODB). Of these, passenger processing solutions such as passenger kiosks, electronic gates, biometric passenger recognition devices, security scanning, and automated passport control systems are witnessing rapidly rising implementation. Subsequently, the segment is anticipated to expand with CAGR estimated to be close to 10% during the forecast period. However, the segment of baggage processing solutions, which held the dominant share in the global airport information system market revenues in 2015, is anticipated to retain dominance throughout the forecast period in spite of comparatively slower growth. In order to curb baggage mishandling and to speed up baggage processing activities and enhance the efficacy at airports, baggage processing solutions are expected to continue to witness high growth in the overall airport information systems market. Airport information systems find extensive usage in developed economies across regions such as North America and Europe. North America presently dominates the market with an estimated 30% of the overall market in 2016. The region is expected to expand at a healthy 7.6% CAGR over the period between 2016 and 2024 and remain the dominant contributor to the revenues of the global airport information systems market throughout the forecast period. Europe is expected to account for a nearly 28% of the market in 2016 and is expected to remain the second-leading contributor to the global market’s revenues by the end of the forecast period. However, the market in Asia Pacific is expected to outperform these two regions in terms of rate of growth over the period between 2016 and 2024. Owing to the rapidly rising number of air travelers and the vast rise in the adoption of smartphones and mobile applications, the Asia Pacific airport information systems market will exhibit a 7.7% CAGR over the said period. The growing penetration of smartphone-enabled solutions closely integrated with different activities/processes during air travel is providing a huge boost to the region’s air information systems market. For instance, services/solutions such as e-check in and home printing of boarding passes are being provided to passengers, which helps them save valuable time and avoid long queues at airports. Moreover, smartphones usage has allowed the creation of new communication channels between the passengers and airlines, thereby providing additional revenues through cross-selling opportunities. The resultant rise in demand for advanced kiosks at airports is another lucrative growth opportunity for market players. Globally, airport information system market is characterized by presence of both large and small players. Four large players, namely SITA, Amadeus IT Group SA, Rockwell Collins, Inc., Siemens Postal, Parcel & Airport Logistics, however, currently dominate the market, collectively accounting for over 80% of the market in 2015. These leading players emphasize on research and development activities in order to gain competitive advantage. Other prominent players in the market INFORM GmbH, Intersystems Group, Lockheed Martin Corporation, RESA, S.A.S., VELATIA, S.L., and Lufthansa Systems GmbH & Co. KG. Over the past few years, there has been an enormous rise in global air traffic and an upsurge in air passengers. With soaring IT spending on airport infrastructure, the demand for airport information systems has grown steadily. Increasing investments by government and private players have led to an accelerated adoption of real-time information systems across domestic and international airports. These systems have helped fleet owners maximize operational efficiency and enhance the comfort of travelers, thereby transforming the overall travel experience. In future, more automation solutions will come in the ambit of airport information systems to meet a variety of operational and data management needs and will boost collaborations across all stakeholders. As travelers become more tech-savvy, a slew of advanced IT solutions will crop up, positively impacting the market in the coming years. As a result, airport systems will witness the adoption of innovative service models and platforms that will underpin a continually expanding market for airport information systems. The report provides comprehensive insights into the key drivers and restraints, major revenue generating segments, prominent trends, emerging technologies, market share and size of key segments, and competitive landscape. The research analysis tracks recent developments in IT solutions delivery models and highlights key investment trends in emerging and established markets. The study based on extensive rounds of primary and secondary researches takes a closer look at key underlying economic factors expected to impact the demand for information systems for managing various operations. The report evaluates the regulatory landscape in major countries that will have a bearing on the market positioning strategies of players. The global airport information system market is primarily driven by the rising demand for more effective and reliable airport information systems to optimize aircraft processes and maximize passengers’ convenience. The increasing adoption of automated solutions for various operational processes has fuelled the market. The constant influx of modular and integrated software solutions by vendors is anticipated to create promising opportunities for several developers of airport information system. However, most information systems call for high-speed network connectivity, advanced electronics, and supporting hardware devices. This significantly increases the implementation cost of airport information solutions, thereby hindering the growth of the market to an extent. On the other hand, spiraling capital investments by several private players and governments of various countries toward the modernization of airports is expected to unlock exciting opportunities for market players in future. 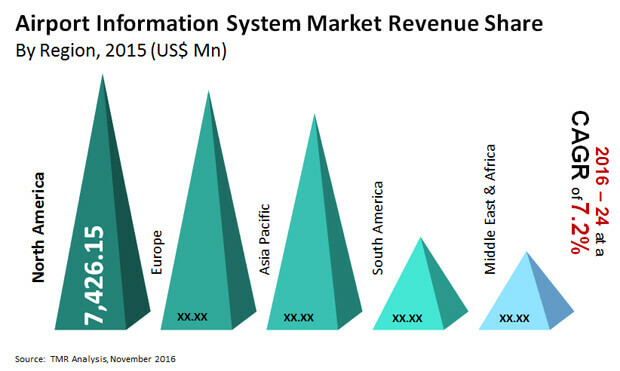 Currently, North America dominates the airport information system market, contributing a substantial chunk of the global revenue. The regional market is expected to witness handsome growth along the forecast period. This is closely followed by the Europe market. Meanwhile, Asia Pacific will witness a surge of lucrative market avenues. The impressive growth of the regional market will be fuelled by a soaring number of air travelers and growing popularity of smartphones and mobile devices among travelers. The proliferation of smartphone-enabled solutions that are closely tied with airport information system is expected to provide a significant fillip to the growth of the regional market. The airport information system market is fairly fragmented. The top four players are SITA, Amadeus IT Group SA, Rockwell Collins, Inc., and Siemens Postal, Parcel & Airport Logistics (SPPAL), which occupy a major share in the market. The leading players are actively focusing on research and development activities to consolidate their presence in major regions. Other key companies in this market include INFORM GmbH, Lockheed Martin Corporation, InterSystems Corporation, Resa, S.A.S., Lufthansa Systems, and VELATIA, S.L.